A few weeks ago, my partner was riding the metro when two men got on the train. 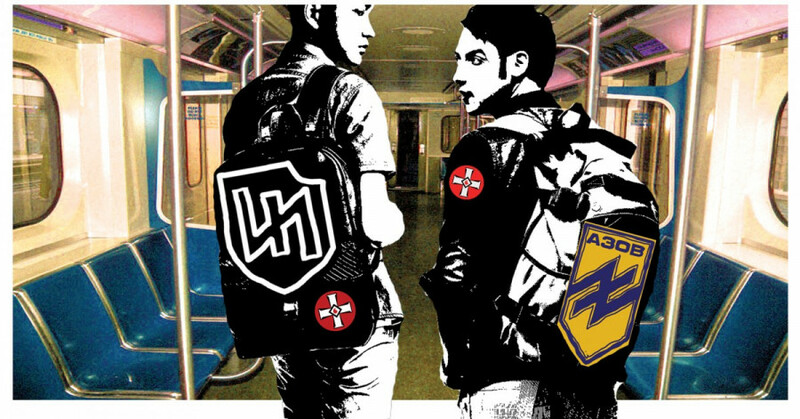 Another man, sitting across from her, complimented them on the patches they were wearing, which read “A30B,” and carried a symbol resembling a Wolfsangel—a symbol of Nazi Germany. The two men started talking to him in Eastern European accents, describing how they just arrived in Montreal, and were still finding their way around. The other man, a Quebecer, said that he could plug them in with the local movement. Afterwards, some Googling revealed that A30B is another name for the Azov Battalion, a military unit in Ukraine filled with neo-Nazis. The two men were looking for ways to connect with the local extreme-right—and by coincidence, they found their man. It might seem easy to laugh off the idea of fascists in Montreal, but ignoring their existence would be a huge mistake. A newly released study found that the extreme-right is growing in Canada—especially in Alberta, B.C. and Quebec. Fascists, the study found, are becoming increasingly active in organized crime and municipal politics. As racists and fascists play an increasingly large role in our society—and on a global scale—it is important that we learn about how to effectively fight against them. The past few weeks have seen a number of significant events worldwide regarding the extreme-right. In Anaheim, California, on Feb. 27, the Ku Klux Klan attempted to hold a rally. The demonstration was announced a few weeks in advance, giving time for the people to organize against them. When the Klan members showed up, they were met by an angry crowd of community members. Anti-racists confronted the Klansmen immediately, and fighting broke out. Members of the KKK reportedly stabbed three protestors, but were seriously beaten and demoralized in the melee. Their demonstration was shut down, and they were chased out of the area. Elsewhere in the U.S., Trump rallies are increasingly becoming hate rallies, often filled with uniformed members of white-supremacist organizations. At a recent Trump rally, a group of people wearing t-shirts with the logo of the Traditionalist Worker Party, a neo-Nazi organization, were assaulting people of colour who were protesting. It is reported that members of the TWP have been recruiting Trump supporters for their organization during the presidential candidate’s rallies. Meanwhile, across the Atlantic, a neo-Nazi group called the North West Infidels attempted to stage a demonstration in Liverpool, England on that same day as the Anaheim Klan demonstration. The location was changed at the last minute in order to confuse counter-demonstrators. Anti-fascists still showed up, and were able to prevent the march. While hiding behind police-lines, fascists threw bricks at counter-protesters, seriously injuring one police officer. This comes just weeks after a coalition of neo-Nazi groups staged a hate rally against immigrants in the port city of Dover, England—a main entry point for refugees to the U.K. Anti-fascists showed up in large numbers, and massive street fighting ensued. With the activity of the extreme-right increasing worldwide, there are a few lessons that we can learn from the events outlined above. Wherever the far-right is attempting to organize publicly, communities must respond and denounce them. Fascists are attempting to recruit a wider following to their currently small organizations, and public rallies are important for increasing their visibility and legitimacy. In Anaheim, locals showed up without the support of institutional representatives and quite literally chased the Klan out of town. The Klan made the mistake of announcing their rally early, and they were met with the force of a unified community. Liverpool is a particularly interesting case in this regard. Knowing that the community in Manchester, where the hate rally was originally supposed to take place, was organizing against them, the NWI changed their location. Despite their switch, people in Liverpool were ready to shut them down. Creating an anti-racist culture within our communities is extremely important. We must be able to understand what’s at stake, and mobilize quickly when the time comes to do so. This needs to continue in Montreal. Fascists are attempting to increase their support by capitalizing on anti-immigrant sentiment that exists in mainstream conservative circles, pushing the moderates further to the right. In the United States, this is highly visible at Trump rallies. A recent report by the Southern Poverty Law Center places blame on the Trump campaign for the sharp rise in membership in extremist hate groups in the U.S. In Europe, much of this rallying has been done under the banner of PEGIDA, a right-wing group which stands against Muslims. While PEGIDA uses the language of “preserving democracy from Islamization,” their rallies have regularly seen a large fascist presence. In Montreal, a local branch of PEGIDA has attempted to hold demonstrations several times in the past year. Each one was successfully shut down by anti-racist counter-demonstrators. This trend needs to continue, because events like PEGIDA rallies are fertile ground for fascism. Violence is an inherent part of fascist ideology. The use of violence by fascist groups increases in direct proportion to their mobilizing capacity. If we apply that knowledge to our own situation, we should understand that fighting against fascism is dangerous, but necessary work. Those who engage in surveilling and disrupting fascist organizing should be aware of this, and act accordingly. The police, and the laws they serve, are not sufficient protection against the growth of fascism. Fascists use democratic freedoms, such as speech and assembly, with the ultimate goal of destroying those freedoms. By the time fascists start breaking laws and using political violence, they have already grown their numbers to dangerous levels. In Anaheim, police arrested counter-demonstrators for fighting against the Klan. In Liverpool and Dover, police actively protected neo-Nazis. At Trump rallies, police protect the candidate and his supporters from protesters who would disrupt them. This is not necessarily because all police are fascist sympathizers, but it is their job to do so. This brings us back to lesson #1—putting down fascism needs to be done by communities themselves. Here in Montreal, we’re pretty good at it. Simply putting down the extreme-right is not enough, though. In order to act in preventative ways, rather than reactive ones, we also need to undo the more subtle forms of racism that are held by broad swaths of the population. It is this type of racism that makes people susceptible to fascist ideology. The fight against the extreme-right also needs to be a part of a broader social transformation.